I have three dogs, therefore a lot of dog hair, which means I have to vacuum frequently. I use this on my tile and hardwood and it does a pretty good job. Clean with ease with the Navigator Light vacuum. Featuring a compact design, it's easy to store, but it still provides the full cleaning power of a larger vacuum. 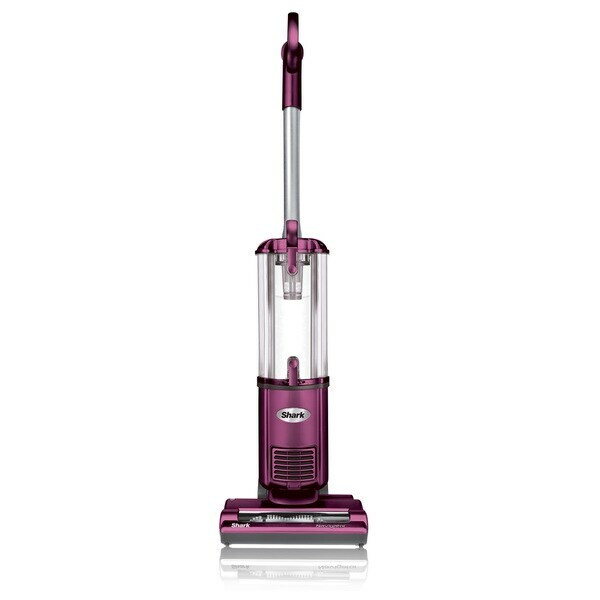 The vacuum provides continuous suction and cleaning power, with two motor system for either carpets or bare floors. A variety of tools and hoses ensure any tricky mess gets cleaned. This vacuum works very well compared to my cheaper Hoover Pet vacuum. It has a way to empty the canister on top and bottom. It has a filter that can be cleaned. It's a fairly small vacuum that weighs 16 lbs but really it feels like 10 lbs. This Shark can get into corners well and the tool suction is great. I'd recommend this vacuum for pet owners and anyone who has an apartment or small condo. Only down side-no rewindable cord and you have to dump it every time (bc it's great at picking up dirt) if you only vacuum once a week. We have been through so many vacuums, I was beginning to think that we were never going to find one that actually worked. This little beast is amazing! With 2 kids and a dog, we vacuum daily and this keeps up with us. Very easy to clean out the tank as this is bagless. If it does get clogged, every piece of hose is easy to remove and clean out. Smaller design also allows me to store it away and it not be bulky. This is a lightweight workhorse. I have pets and there is always fur on the floor. This digs all debris and fur effortlessly. In addition, the bare floor is easy to keep clean as well. Sometimes I think the rug is pretty clean and the canister still fills up with dust and fur. Best vacum I have ever owned. We have only had this for a week, but so far it is excellent. So easy to use that vacuuming is no longer a struggle. This small, bag-less vacuum has picked up deep down dirt missed by previous vacs. It is very light weight, maneuverable, has a low noise level, intuitive functions. Very easy to clean the filters and dust bin.! Easy to use, light and picks up well. The suction is great and I am always amazed at how much it picks up. This is my second shark vacuum. I had a Dyson but hated it. Just wasn't impressed for the price. Shark delivers a great clean. This is the second Shark model I have purchased because it works so well and is not cumbersome. It has great maneuverability. As a test, I ran this Shark vacuum over my living room and bedroom carpet just after I used my older vacuum (different brand). I was surprised at how much more fine lint and dust particles this Shark picked up. This is better technology because it maintains more suction. Very lightweight but powerful, works great on carpet and hard floors, small enough to maneuver in small places. For the price this has been a great little vacuum. Have used to years and love it. At a great price. Works wonderful, quiet and powerful! It arrived today and vacuumed a large rug which had cat fur imbedded in it. The Navigator pulled out all the cat fur I could see and my rug is clean again. I tried it on the hard wood floors and it worked well. I like it because it's lightweight and easy to handle. this vacuum works well. we have another shark at home and this is for a rental property. this one is a bit heavy, but serves it's purpose. i like that the attachments fit/attache to the actual vacuum. easy to empty out. would buy again. Hardy any real assembly needed. Only used twice so far but propels and cleans like a charm. Great value for the money! I just received my new vacuum & LOVE it!! Lightweight & works great on the carpet & bare floors....easy to use & operate/received quickly after I ordered....I love Overstock!! I love shark I had one already this is my second one I would tell everyone to buy one! I'm not thrilled with this little vac but probably my fault for getting a 700 watt. I mainly got it for frequent pet hair pick up on carpet and it does not pick up pet hair well. I keep going over and over the area and finally just reach down and pick it up by hand. It's fine on non carpet surfaces. I had such hope after reading the reviews and wanted something lightweight that would do the job. LOVE this vacuum! It works great and is compact enough to not be in the way in our laundry room where we store it. It is very lightweight too and has held up over time since we bought it a while back. Had a Shark before and liked it. This one is suppose to be lightweight and easy to use. I have a very had time pushing vacuums do arthritis. "How much does this vacuum.weigh?" The vacuum weighs 16 pounds. "how many watts does this motor put out?" This vacuum is a 700 watt.